Big Guy Landscape provides all aspects of landscape maintenance, to keep your property manicured and beautiful. 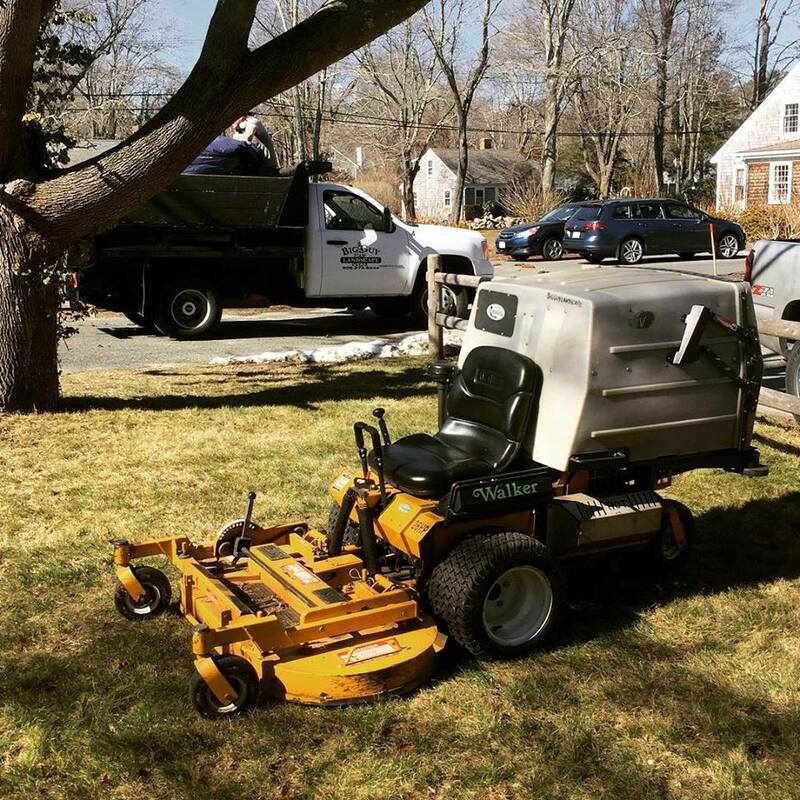 Lawn Cutting Big Guy Landscape utilizes top notch Walker brand mowers. We completely mow and trim all grassy areas as well as place a vertical edge on all beds, patios, and walkways for a nice clean crisp look. All grass clippings created are bagged and removed from your property. Fertilizing Each and every property is different. Therefore Big Guy Landscape can arrange for on-site -free- assessment that includes the following: Turf Density, Grass Variety, Thatch Depth, Shade, Apparent Insects, Weeds, Turf Diseases, Square Footage of Lawn. Based on the results, a customized program of fertilization, soil conditioning, weed and pest control will be devised for your property. Core Aeration is the removal of small cores of soil to allow air, moisture, and fertilizer to penetrate the root zone. This is extremely essential to our lawns which typically have a lot of clay present in the soil. Core Aeration should be considered two times per season - once during the early summer months, and once during the fall. If you are going to aerate only once during the season, we recommend aerating in the fall. A third aeration will not hurt, it will only help. Lawn Dethatching Controlling thatch is one of the most important - and most overlooked - parts of lawn care. Thatch is simply the layer of dead grass, roots, and debris that accumulates between the soil surface and the green grass blades above. Over time, it forms a thick mat, hindering water and air from reaching the soil and providing an environment that can encourage pests and diseases. Dethatching can help prevent these problems. Almost every lawn needs dethatching about once a year, or whenever the thatch reaches a thickness of about 1/2 inch. Big Guy Landscape utilizes both manual and power thatching methods to achieve the desired results. Trimming, Pruning & Shaping Big Guy can trim and shape any shrub to meet your landscape’s ever changing needs. Our knowledgeable staff is experienced with all varieties of shrubs, to promote a healthy full plant. Tree Services Big Guy Landscape facilitates services for every aspect of arboriculture. Spring Clean Up Consists of a complete clean-up of leaves and debris from lawn, and landscape, edging of planting beds in preparation for mulch application and planting. April and May is Spring cleanup time, usually starting late in the first week of April and running through May: depending on the weather. Mulching Big Guy Landscape offers a wide variety of mulch colors and textures. We buy our mulch in bulk so we can pass the savings on to our customers. Whether you need your flower bed refreshed by our staff or you need a delivery of our product so you can do it yourself. Big Guy can suit all your needs. Big Guy Landscape utilizes Bark Mulch Blower that provides a finished painted on look to your mulch beds. Some customers still prefer their mulch to be spread by hand, whichever way you prefer Big Guy will provide a beautiful finished product. Fall Clean Up Consists of a complete cleanup of leaves and debris from your property in preparation for the upcoming winter. Usually Fall clean ups start in mid-November when the majority of the leaves have fallen off of the trees. Gutter Cleaning is available throughout the year, though most often during the spring and fall. We clear the roof and gutters of debris that collects throughout the year. We also blow out the downspouts with a fast, high-volume blast of air, clearing out any debris that may be stuck. Big Guy Landscape offers programs geared towards the maintenance of your existing irrigation system. Spring Irrigation Turn On is a complex process to ensure irrigation systems are working correctly. The process includes checking proper coverage of the property, checking for leaks throughout the system, and setting the systems run times for the current weather conditions. Mid-Season Check Up is typically performed in August and consists of a visit to your property to ensure your system is running properly, assess the system for repairs and adjust the timer depending on the current weather patterns. Fall Irrigation Turn Off consists of a step by step process in which Big Guy Landscape visits the property to fully winterize the Irrigation system in order to properly survive the cold winter months ahead. Turn the valves of the back-flow system to half off / half open. Systematically turn on each respective irrigation zone and blow out the water lines and sprinkler heads. Unplug the control box and pull out the back-up battery if applicable. Landscape Design is a large part of constructing a beautiful landscape. It’s where we take your wants and our years of industry experience to come up with a plan that meets both beauty and functionality. Planting of trees, shrubs, and flowers is a delicate process. It starts with choosing the right tree, shrub, or flower to meet the customer’s needs as well as survivability in the conditions of the planting environment. Big Guy utilizes industry practices that are in line with the highest industry standards. Big Guy utilizes Nurseries that provide the highest quality trees, shrubs, and flowers. Lawn Installation Everyone wants that beautiful green lawn. 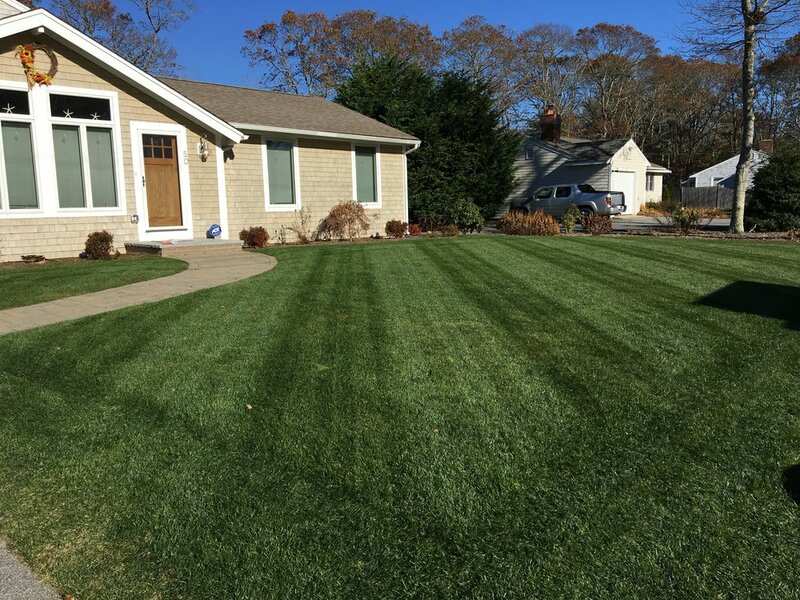 Big Guy Landscape handles everything from loam procurement to choosing the right type of grass for your yard’s conditions. Irrigation Design & Installation Our knowledgeable irrigation division is equipped to properly design and install an irrigation system to meet the needs of your property. Fencing can be for the security of your property or just to add a certain aesthetic value to your property or even both. Big Guy can provide various styles and materials options to suit the customer’s needs and wants. Landscape Lighting Installing landscape lighting is one of the most convenient ways to decorate the outside of your home and add security for you and your family. With the right outdoor light fixtures, you may showcase your garden or enjoy your patio even after the sun sets. Big Guy Landscape utilizes the highest quality landscape lighting products to suit the customer’s wants and needs. Crushed Stone- Various sizes and colors available to suit your individual taste. Paver- Various designs, colors, and materials available to suit your individual taste. Big Guy can also provide your driveway with a border or an apron which can contribute to its functionality and aesthetic value. Walkways A walkway is the first thing that guests see as the come to your door and the last when they leave. A walkway should make for a grand and proud entrance when you arrive home. They can be constructed in various designs and a wide variety of materials. Big Guy constructs its walkways to the highest industry standards with top notch materials and practices. Patios A patio is often seen as an extension of your indoor living space. It is often a place that is the focal point for outdoor living. They can be constructed in various designs and a wide variety of materials. They can be built to support an outdoor kitchen or fire pit. Big Guy constructs its patios to the highest industry standards with top notch materials and practices. Traditionally, the favorite hangouts in the home have been the kitchen and family room. But today, the backyard is taking over as the favorite gathering space for cooking, entertaining and relaxation. Big Guy Landscape offers a wide variety of ideas and designs to make all of your dreams a reality. Outdoor Kitchens An outdoor kitchen increases your outdoor living space. They can be customized to fit any appliance from a gas grill to a pizza oven. The beauty of an outdoor kitchen is that they can be custom built to match the customer’s personality. Big Guy is capable of making all of the customer’s dreams a reality. Outdoor Fire Pits An outdoor fire pit/place is an excellent addition to any outdoor patio. It creates an ambiance on your patio all its own. They can be gas or wood burning and come in a multitude of designs. Big Guy Landscape can install a fire pit to any patio, and will work with the customer to fit any budget from a lower end wood burning pit to the higher end natural gas units. 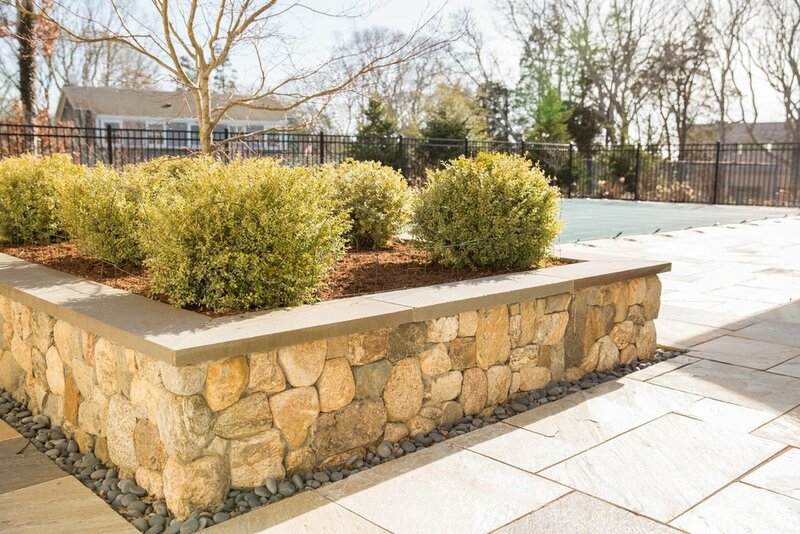 A retaining wall can hold back a hillside and turn steep slopes into living space. They can serve a function as well as beautify a property. They can be constructed in various designs and heights. There’s a wide range of materials to choose from both natural and manufactured. The depth of their construction depends on the size and location of area to which they’re to be installed. Big Guy Landscape facilitates all commercial snow and ice management needs. When working against the unpredictability of Mother Nature, when you need an experienced partner that has the resources and local dedication required to deliver solutions for the unexpected. Whether it’s roof top snow removal or emergency snow removal at a location neglected by another contractor. Big Guy Landscape is dedicated to keeping your business running as usual. We take care of snow removal and ice control promptly, efficiently and seamlessly. Whatever the weather, you can conduct your business as usual. We provide trucks equipped with snow plows, as well as a wide variety of heavy machinery equipped with push boxes for increased efficiency. When snow has to go, we have the capability to maximize your parking capacity and keeping your lot safe and inviting so your customers keep coming. Our crews will have your walkways accessible and safe for the foot traffic coming and going during the storms. We can apply rock salt, sand or specialized products, to both prevent and remedy an icy situation.